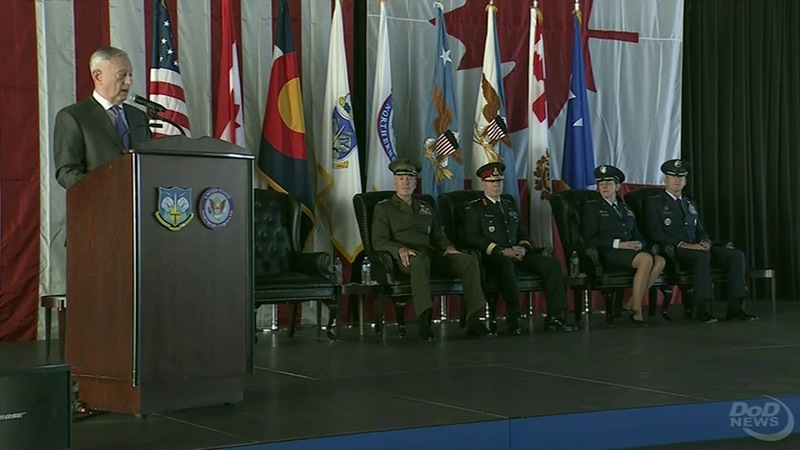 Defense Secretary James N. Mattis presided at the North American Aerospace Defense Command and U.S. Northern Command change-of-command ceremony at Peterson Air Force Base in Colorado Springs, Colorado, today. 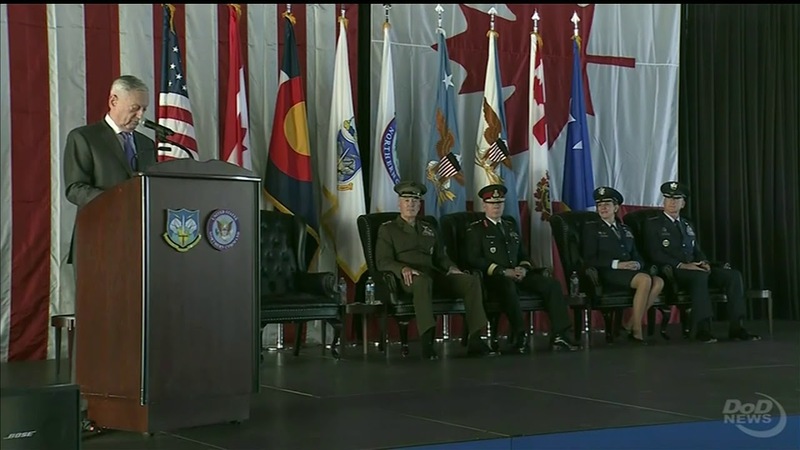 Mattis thanked the families of outgoing NORAD and Northcom commander, Air Force Gen. Lori J. Robinson, and the incoming chief, Air Force Gen. Terrence J. O'Shaughnessy. O’Shaughnessy previously served as commander of Pacific Air Forces, air component commander for U.S. Pacific Command, and as executive director of the Pacific Air Combat Operations Staff, Joint Base Pearl Harbor-Hickam, Hawaii. NORAD was established 60 years ago as a joint and binational command – co-managed by the United States and Canada -- that conducts aerospace warning, aerospace control and maritime warning in the defense of North America. Mattis lauded Robinson’s leadership in helping to safeguard North America, noting she’d “maintained 24/7 readiness in response to the ballistic missile threat from North Korea.” . “How many times did I hear your steady, clipped voice on the net, giving clear updates of missiles in flight and ensuring our team was ready for anything with only minutes for decision? And you stood the watch,” Mattis said to Robinson. During Robinson’s command of Northcom, she battled the elements of Mother Nature while “calmly manning the helm as three Category 4 hurricanes bore down upon our shores in rapid succession,” Mattis said. “These storms spanned a range of 2,200 miles, impacting 30 million people from Texas to the U.S. Virgin Islands,” the secretary added. Northcom’s support to civil authorities during those events showcased the command as having conducted the largest, most complex domestic deployment of the U.S. military in modern history, Mattis said. “Under your leadership, Northcom deployed more personnel, flew more sorties, engaged more ships and delivered more relief supplies than any previous domestic response, including Hurricane Katrina,” he told Robinson. Mattis told O'Shaughnessy the Defense Department has called him back from across an ocean to command once again, making him responsible for defending North America against many significant threats. “I charge you with increasing our warfighting lethality and enhancing military readiness across both commands,” the secretary said. The secretary said the threats North America faces today are more sophisticated and less predictable than those NORAD faced at its birth.